I have been buying stuff on eBay for at least five years now. I’ve never attempted to list an item for sale, until yesterday when I saw a brand new with tags North Face jacket in my closet. I purchased the jacket a few months ago without trying it on. I finally tried the jacket on yesterday and found out that I didn’t like the way it fit. So I decided to list it for sale on eBay. I spent the next hour on my phone, taking photos of the jacket from different angles and crafting the description of my first ever eBay item for sale. When I was ready, I tapped Publish Listing to finish listing the item for sale. And that’s when the Policy Error message below appeared. The complete English text of the Policy Error message is below. [alert color=”yellow”]Attention! 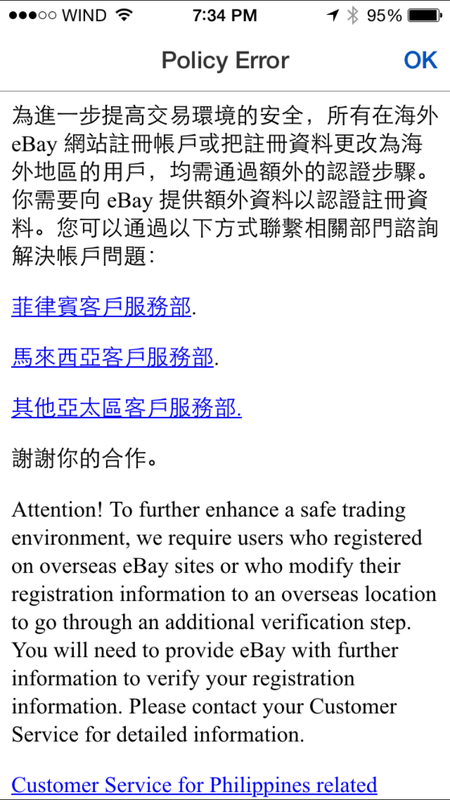 To further enhance a safe trading environment, we require users who registered on overseas eBay sites or who modify their registration information to an overseas location to go through an additional verification step. 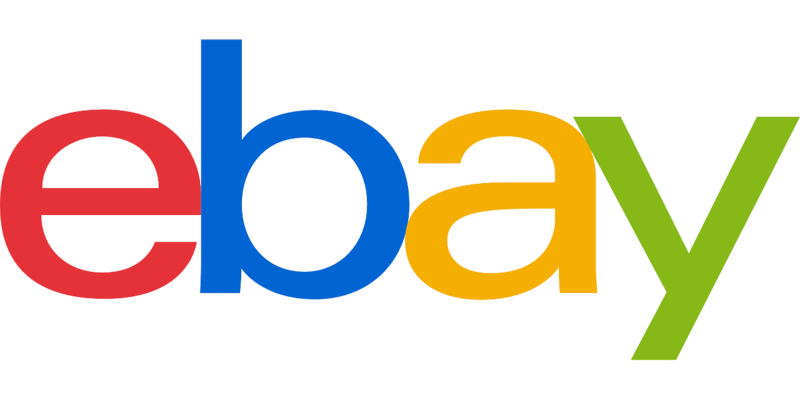 You will need to provide eBay with further information to verify your registration information. Please contact your Customer Service for detailed information. I noticed that all of the customer service contacts that the message was suggesting were for Asian countries. Then I remembered that I created my eBay account when I was living in Asia, and then changed the country to when I moved to North America a few years ago. I realize that that’s probably what’s causing the error. So I decided to contact eBay support by phone. Thinking that I have over 300+ feedback ratings and they’re all positive, this issue shouldn’t take long to rectify. Wanting to resolve the issue right away, I looked up and called the support number on the eBay website. Here’s what I did next. I called the global support number. This number isn’t visible on the eBay website. I had to click the Contact Use link on the website, and then selected the type of issue I was experiencing (in this case, “Selling > Unable to list an item”). When the Call Us link appeared, I clicked it and the support number plus one-time passcode I was required to use appeared. I followed the prompts presented by the automated call-taker and waited at least 15 minutes before I got through to a human representative. That I am trying to sell an item for the first time. The representative was very courteous — she had to put me on hold several times and kept apologizing. It was obvious she was trying to figure out what was going on and what we needed to do to resolve the issue. 35 minutes after I started the call, she got back to me and informed me that she had checked everything she could but couldn’t find a resolution to my issue. She said she’ll check with other eBay departments and call me within the next couple of hours. I waited the rest of the day, but I didn’t hear back from the representative. The next morning, I called the global support number again, and again went through the entire process of waiting and being put on hold. After 30 minutes, the representative I was speaking with told me that since I had moved to another country, I am required to verify my identity. She said she was in the process of emailing me the information I am required to submit to verify my identity. Of course, I complained and grumbled that I have over 300+ positive feedback ratings and I’d been using eBay for a long time. It was futile — she couldn’t do anything until I submitted the required documents. I said okay, thanked her for her help, and hung up. A few minutes later, I received an email from eBay that outlines the documents that I need to submit. * Documents that prove that you purchased the item(s) recently listed for sale on eBay. This can include manufacturer invoices or receipts. Photos of the items don’t fulfill this requirement. Your information will be treated with care. Please remember we are only asking for this information in order to keep our site safe for all buyers and sellers. * If you are sending a bank statement, please black out the bank account number. * If you are sending a credit card statement, please black out all but the first and last four digits of the card. * Be sure to include the username and email address of the suspended account on all documents. * Do not Photoshop your username onto any documents. * Be sure your submitted documents are current, valid, and legible. The contact information on the documents you send us needs to match the information on your eBay account. If it doesn’t, you’ll need to let us know in writing why there are differences. If your address on eBay is your work address, you’ll need to send us proof in writing so we can confirm that. Once you’ve faxed your, information we should be able to get back to you within a maximum of 7-10 days. We appreciate your patience while we get this done. I understand your concern regarding this matter and apologize for the inconvenience it has caused you. Apparently, my account is suspended from selling until I complete the identity verification process. Also, the verification process could take up to 10 days (and I’m assuming it meant ‘business days’). So today, I scanned all of the required documents and uploaded them to the link provided in the message from eBay. I’m keeping my fingers crossed that they won’t come back and ask me for additional documents. I’ll post an update when I hear from eBay. Honestly getting suspended by eBay is the worse. Not only are their reps pretty much useless, they give you the run around. I had contacted Auction Essistance to see if they had any advice, but much like many of their clients. They say eBay really doesn’t provide much on this and that getting it back is a slim chance.